Ana Sayfa INTERNATIONAL No to support for ISIS and regional military action motion! No to support for ISIS and regional military action motion! 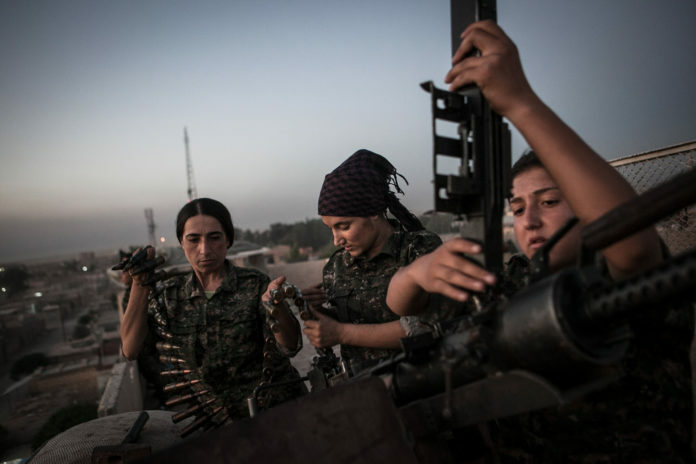 (SYRIA) Captain Ronahi Anduk, 34, left, Gian Dirik, center, and Dirsim Judi, 18, right, work on the Dushka weapon at the YPJ center in the town of Til Colture, on the border of Syria and Kurdistan on Aug. 9, 2014. The YPJ, pronounced "Ya-Pa-Jah" in Kurdish, founded in 2011, is a vigilante non-government military unit formed by the Kurdish citizens of Roshava, a province of Kurd citizens in Syria, with the mission of protecting the citizens of of the region. The YPJ's creed is protect all people, regardless of race and religion, which has made them one of the leading forces battling IS in Syria and Kurdistan, while also aiding the Peshmerga and the PKK. The YPJ and YPG (men's unit) is responsible for evacuating thousands of Yiziti refugees who were stranded in the mountains of Shingel without food or water for over a week. There are about 7,000 - 8,000 women fighteres in the YPJ. Justice and Development Party is getting ready to pass a new motion to allow military action and cross border intervention,although it was the president and the prime minister who have introduced the approach ‘zero problems with the neighbours’ policy. The Parliament which has approved 25 military action motions beyond its borders so far -10 of which by JDP government- will negotiate extending the motion for another year as the first thing on the agenda in this new legal year. JDP is bringing a new motion for military action on the table as if the ones approved before had worked out. While there are dozens of problems in the country such as hundreds of work kills, violence against women, discrimination against all beliefs but Sunni-Islam, blocking the peace process for democratic solution to the Kurdish question launched by Abdullah Ocalan, the very first thing that the Grand Assembly does is negotioating war. Why? Following the US imperialism, capitalist/imperialist powers re-designing the Middle East for their own interests not only caused the death of millons for decades but also created millions of refugees and chaos in the Middle East. The interventions justified through the lies of bringing democracy into those countries in the region enforced anti-democratic practices and what is more is that they inflicted the extremist Islamic militants on the people of the region. Turkish state with its JDP government sponsored by the Turkish capitalist groups supported every imperialist intervention in order to become ‘the only power’ in the region counting on the Muslim majority in the country and made alliance with the jihadists to suppress Kurdish struggle for freedom. The motion approved on March 19 to make up for the failure of the motion in March 1 2003, another motion approved in October 17, 2007 to carry out a land operation directly against PKK. They all had disastrous consequences and yet; alliance made to take Assad down failed too. ISIS is a monstrous, murderer terrorist organization established on the historically contested territories both by imperialism and its regional ally; Turkish state and JDP regime. It is a means by which the US imperialism tries to realize the Great Middle East project and to propagate the new world order using the fault lines based on Sunni hegemony and sectarian sentiments in the Middle East and North Africa. Muslim Brotherhood, Al-Qaida, Al-Nusra, Free Syrian Army, ISIS and Khorasan organization that has been spelled out more lately are all Islamist, reactionist groups which are fostered by this particular Sunni fault line and deepens the cracks/polarizations more and more every day. While the US and Western imperialisms are using them to re-design the Middle East, these jihadist groups are using the imperialist support to gain power and massacre those who are not from ‘them’ by forcing them to surrender. 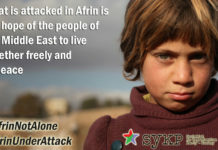 Turkish state ruled by JDP both aims to be one of the hegemonic actors in the re-constructed Middle East by these imperialist interventions and desires to prevent Kurdish Freedom Movement from moving forward. Moreover, new Islamic regime which has been underpinned by the JDP government shares the same ideological basis and sources with the Salafi groups. The main reason why the government made Turkish territories and the borders as main routes available as locations for assisting jihadist groups with their camps and logistics needs is because JDP is still holding onto the fantasies of hegemonic power. JDP is the supporter, protector and ally of the jihadist/salafi groups that have been terrorizing the Middle East for years; and committed the most despicable, horrific massacres of all in human history. Today, through military action motion, JDP threads the grounds of new ways to assist these groups for the goals we described above. ‘Buffer Zone’ as suggested by the President and the Prime Minister over and over again will indeed be a brand new and safe region for the jihadist groups. As such, they will hinder Rojava and drag it into chaos and turmoil, a region which Kurdish people accept as a safe haven for a peaceful co-existence. -Supporting 4+4+4, mandatory religion classes, more conservatist everyday life, more imam-hatip schools (religious vocational high schools). -it means patriarchy in which women will be trapped via Islamic extemism. -There is no peace or democracy that can be provided by a coalition led by the US. -Stop dropping bombs that will not be real solution. Stop providing military, logistic, diplomatic and economic support for jihadist groups, sectarian wars immediately. 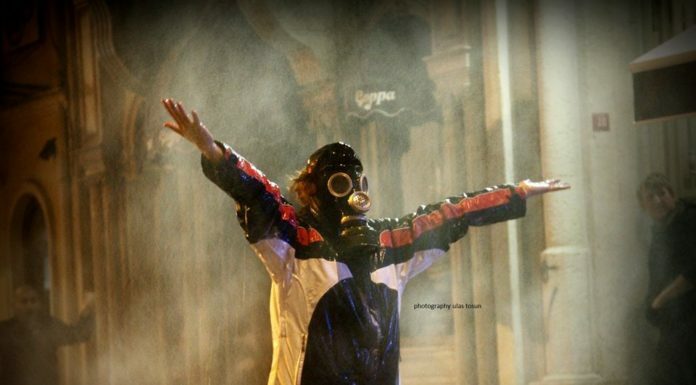 -We should promote and embrace peace and take to the streets against the military action. We call all the parties besides HDP claiming that they are in oppostion to JDP. Say no to ISIS and say no to regional military action motion!